Is there an emergency in your area? 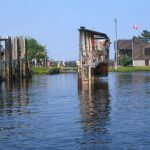 Ontario cottage-country communities should be vigilant especially in the spring, as this is the time of year when we can experience lots of melting snow and ice, heavy rainfalls, and high water flows on lakes and rivers. Conditions can change quickly, so being prepared in advance is the best possible approach. FOCA and our local associations remind all homeowners to take measures to protect themselves and their belongings. 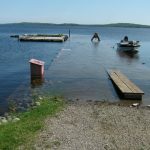 Cottage country buildings, docks, and boathouses located in or near the floodplain are at particular risk. Preventative action can minimize loss, but overland flooding is a real risk for those located in a flood plain or close to rivers or lakes. For more information regarding watershed status, please visit the website of your local conservation authority. These are Kawartha Conservation, Otonabee Region Conservation Authority, Ganaraska Conservation Authority, Lower Trent Conservation Authority, Lake Simcoe Region Conservation Authority , Cataraqui Region Conservation Authority, in all other areas of the Trent, Severn and Rideau Watersheds, the Ontario Ministry of Natural Resources and Forestry. Flood damage caused by overland flooding is not generally covered by home insurance policies in Canada (though a few companies may now have it available), so it is important to protect yourself from the potential damage of floods. Flooding from sewer or septic system backup may be covered, but in any case it is important to understand your home insurance policy to see if these types of coverages are included. * About ODRAP: The Ontario Disaster Relief Assistance Program (ODRAP) is a provincial financial assistance program intended to alleviate the hardship suffered by private homeowners, farmers, and small businesses whose property has been damaged in a natural disaster declared by the Minister of Municipal Affairs and Housing. ODRAP is not an alternative or a substitute for private insurance coverage and risk management. Damage claims should be directed first to insurance companies to determine coverage of individual policies. May 8, 2018 – “Family devastated as ‘heirloom’ cottages smashed to bits.” CBC News coverage of flooding in New Brunswick. April 4, 2018 – Today, Parks Canada launched the Ontario Waterways Water Management InfoNet for the Trent Severn Waterway, and for the Rideau Canal. The InfoNet contains background information on water management practices, water management updates, frequently asked questions about water management, various reports on water management, and the most recent water levels of lakes along both the Rideau Canal and the Trent-Severn Waterway. Of specific note is the new water levels tool within the InfoNet which provides lake levels data from the last 30 days and graphic representation of levels for the current year. The information comes from hydrometric gauges located at key points along both waterways and is vetted by trained and experienced Parks Canada water management staff. Parks Canada notes that stakeholders should continue to refer to their respective Conservation Authority or the Ontario Ministry of Natural Resources and Forestry as the primary source for relevant flood forecasting information specific to their area. • store items that may be swept away in flood water to a higher location, e.g. lawn furniture, landscaping features, etc. Canada’s system for managing flood risk is a patchwork. There is a vital need to raise the “flood-risk IQ” of Canadians through education and regular communication on flood risk. Mitigation by communities and property owners. It should be emphasized that risk-reduction measures are a necessary, but not sufficient, precondition for improved flood management. Even if all the elements of risk reduction identified here are acted upon, some existing properties in flood zones will remain at risk. June 1, 2017 – FOCA asks the Premier of Ontario: What about financial consideration for SEASONAL property owners? People don’t understand their flood risk. So why would you do anything about it? May 2, 2017 – Partners For Action is working on a national communications strategy on flood risk, to talk with one voice and one message: governments, insurance, academia, non-governmental organizations, to get the message across. Read more. FOCA is a member of the stakeholder advisory group for the Partners for Action. According to an RBC Canadian Water Attitudes survey (released March 25, 2015), 55% of surveyed Canadians felt they were not very, or not at all, prepared to deal with the uninsured losses resulting from a flood. From the same survey, people that have experienced flooding are 1.5 times more likely to take steps to flood-proof their homes! If you have buildings, docks, boathouses, decks, equipment, boats, stored or located in the floodplain, or near the high water level of your nearby lake or river – you may be at risk. Poorly drained lots (frozen or shallow soils, rock, or clay) can cause poor surface drainage. Runoff from heavy rain or melting snow can result in standing water, flooding, foundation settlement or damage, or basement dampness. A well-planned drainage system will help keep your lot, and your neighbour’s, free of standing water. Clear eavestroughs and downspouts – if safe to do so – to direct water away from your home. Ask someone to check your property if you are away for extended periods. Review your insurance policies – call your insurance professional if you have questions about your coverage, particularly related to overland water. Move valuable items from the basement to upper floors. Dry any flooded areas quickly, to prevent mold growth. Industrial-sized air dryers are often used in these instances and are typically available for purchase or rent at one of the major hardware stores. If the water is from a freshwater source, quickly retrieve from the flooded area any valuables. If the flood source originates from the septic system, avoid contact with the water and do not cross-contaminate unaffected areas by walking in and out of the contaminated areas. 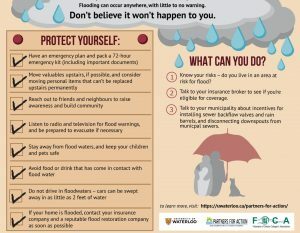 Review tips and get more information about how to protect yourself in the “Flood Matters” infographic, from FOCA and our partners at the University of Waterloo, and Partners for Action. Sudden and accidental bursting of plumbing pipes and appliances is usually covered by home insurance policies. Water damage in a basement due to a sewer backup is only covered if specific sewer backup coverage has been purchased. Overland flooding resulting in water overflowing onto dry land and causing damage is not covered in home insurance policies in Canada. For those Ontarians looking for answers, or if they need help with their insurance questions, please call the IBC Consumer Information Centre at 1-800-387-2880. For CottageFirst customers, contact Cade Insurance brokers at 1-844-CADE-1ST (223-3178). Under the Emergency Management & Civil Protection Act (EMCPA), every municipality must have a designated Community Emergency Management Coordinator (CEMC). CEMC contact information can be gained by contacting your municipal office. Residents located on or near the Trent-Severn Waterway or Rideau Canal should read this Spring Water Flows Update from Parks Canada. Flooding in Cottage Country in 2013 – FOCA’s Terry Rees was on the road between Muskoka and the Kawarthas during the flooding of the Black and Muskoka rivers in April, 2013. Our Executive Director posted web updates and short video blogs from the field as the water rose. Our online posting that month brought the news to hundreds of affected property owners. Many members reported flood damage. In the aftermath, FOCA was in contact with MNR’s Surface Water Monitoring Centre, the Trent Severn Waterway (TSW), Emergency Management Ontario (EMO), and county and municipal partners, in an attempt to arrive at more robust and well-understood emergency response communications in rural Ontario. FOCA continues to review water management communications protocols with all these partners. Visit the Parks Canada website to access the full reports: 2011 Water Management Study, and the 2013 Gull River Flood Review. The Muskoka Lakes Association also commissioned a third-party report related to the April 2013 flooding in and around the Muskoka Lakes. The key findings are here. 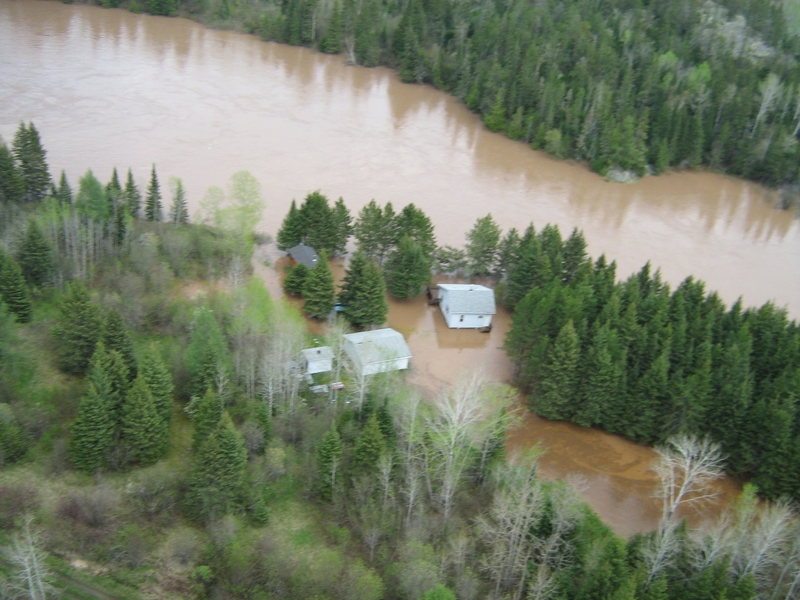 May 8, 2013 – Lake of Bays mayor estimates damage for residents around $10-million; seeking flood funding. May 1st, 2013 – important update for cottage properties in the Minden Hills area: both permanent AND seasonal residents are now being encouraged by the Township to complete a Property Assessment Form if you have flood damage. For 2013, the Insurance Bureau of Canada (IBC) announced that severe weather caused a record amount of damage in Canada, and Aviva Canada identified water damage as the primary culprit.